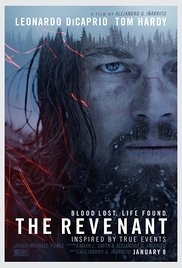 The Revenant is the story of Hugh Glass (Leonardo DiCaprio) and is loosely based off of his true story. Glass is a frontiersman in America in the 19th century working with a fur trapping corporation. Glass, along with his son and about 40 other men begin to close up their operation when they get ambushed by Native Americans. It’s an incredible sequence that actually makes you feel as if you are one of the 40 fur trappers fearing for your life. Arrows are whizzing past your head, you dive underwater to avoid attack, and you are one of the few survivors along with Glass, his son, Fitzgerald (Tom Hardy), the leader of the mission Captain Andrew Henry (Domhnall Gleeson) as well as a handful of others that narrowly escape. The group is stranded in the wild, and they rely on Hugh Glass’s expertise and navigational skills to get them back to safety and civilization. One morning, as Glass tracks a route, he comes across a Mama Bear and her cubs. As Glass prepares to kill the animals for fur, the Mama Bear viciously attacks Glass. Similar to the opening sequence, this is another brutal and exhausting scene. The scene is one long take as the bear picks Glass up with her teeth throws him around like a rag doll, leaves, and then comes back and does it again. Almost all of us will never have to experience the torture of being attacked by a bear, but if you ever want to know what it feels like, just watch this scene on repeat. The scene, much like the movie itself, is a credit to the film’s director Alejandro Gonzalez Inarritu (Birdman, Babel) as well as its cinematographer Emmanuel Lubezki (Birdman, Gravity). It’s daring and unlike anything you’ve seen before. You feel as if you are immersed in this world and you are presented with a type of film-making that makes you feel as if you are there in the action and not watching a film. The bear attack leaves Glass nearly dead, so Captain Henry orders Fitzgerald, Glass’s son, and another crew member Bridger (Will Poulter) to take care of him while the rest of the crew can forge ahead. While Glass’s son and Bridger are out foraging, Fitzgerald, believing that Glass’s existence is a detriment and believes, for their safety and survival, that killing Glass is the right thing to do, attempts to suffocate Glass. Glass’s son comes across this, and tries to stop Fitzgerald. Fitzgerald kills Glass’s son, believes he has killed Glass, buries him in a shallow grave, and Fitzgerald grabs Bridger and they attempt to catch up with Captain Henry and the others. For about two more hours after this occurs, The Revenant follows people as they wonder through the snow. We follow Captain Henry, we follow Fitzgerald and Bridger, and we follow Glass himself. For some unknown reason, Glass, through sheer power of will and against seemingly common logic, wills himself out of the grave and crawls through the snow to get his revenge on Fitzgerald. As if I wasn’t already out on the movie as it were, watching people dredge through the snow explaining their thoughts and actions (when there’s even dialogue at all) was just tiring. I didn't care for any of the characters, and I didn’t care if Hugh Glass froze to death like Jack Nicholson at the end of The Shining. And for all of the technical genius that went into this film, the acting was generic at best. Despite the fact that this film doesn’t get made without him, Leonardo DiCaprio gives his worst performance since Inception. I take that back, he did his best for what the role demanded him and his character to do, but I could only hear him grunting in pain for so long. Leo deserves to have an Academy Award, and it’s not as if when he eventually wins this year he’ll be beating out a more deserving candidate, but it will be frustrating looking back on Leo’s career knowing his first (and hopefully not last) Golden Statute came for this role. Tom Hardy, another great actor who has given great performances over the past few years, also earned himself an Oscar nomination, gets his first nomination for playing a two-dimensional character and grumbling through his lines. Fitzgerald only exists in The Revenant as a foil and a nemesis, and he is overtly the bad guy without any nuance to his personality. The main things I look for in a movie are characters and story. To me, if you don't have those two things, you don't have a good film on your hands. Unfortunately for The Revenant, those are the main (and probably only) two things the film lacks. The Revenant truly is a spectacle unto itself with incredible direction, cinematography, production design, and costume design among other things. But at the end of the day, those amazing technical aspects don't amount to anything if you can't enjoy the finished product as a whole. WHAT DID YOU THINK OF THE REVENANT? LET US KNOW ON OUR FACEBOOK PAGE!